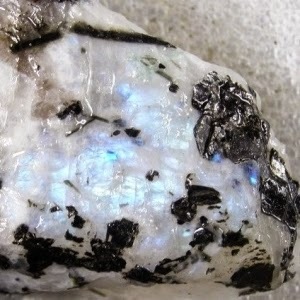 Physically, it is said that Moonstone can promote conception by aiding all aspects of the reproductive system. Many women like Moonstone for its ability to balance hormonal and menstrual cycles. Moonstone is also known to help with the digestive system, including the liver, and can aid in the absorption of essential vitamins and minerals. Issues and Ailments (Emotional):Anger, Centering, Composure, Emotional-Balance, Emotional-Healing, Fear-of-Dark, Happiness, Harmony, Hope, Nurture, Positive-Energy. Issues and Ailments (Spiritual):Ancient-Wisdom, Balance-Aura, Energy-Work, Enhances-Dreams, Healing-Increasing-Awareness, Higher-Consciousness-and-Will, Higher-Realms, Intuition, Protection, Serving-Humanity, Vision-Quest.